Honeybush is made from the Cyclopia sessiliflora plant from the mountains of the South African Cape. It is very similar to Rooibos in taste and health aspects, yet it is naturally a little more sweet. We took the highest grade Honeybush and blended in vanilla bean pieces and marigold petals to create our naturally caffeine-free Vanilla Bean Honeybush. I had my doubts, but this Vanilla Bean Honeybush from California Tea House is really tasty. It is sweet and it is loaded with real vanilla flavor. I love that the vanilla notes here don’t taste artificial. This tastes like true vanilla. It’s sweet and creamy deliciousness! The vanilla is the strongest flavor that I’m tasting here. And like I just said, it’s deliciously sweet and creamy. But the honeybush can be tasted too, and it adds a hint of honey and a nutty tone to the background. I love the simplicity of this blend – it’s just vanilla and honeybush (plus a little bit of marigold petals to add some pretty color to the blend.) But it’s also a really smart pairing, because honeybush – as well as it’s South African cousin, Rooibos – tend to produce a somewhat thin textured liquid, but with the creaminess of the vanilla … it doesn’t feel thin. This feels pleasantly soft and smooth to the palate. To get the most out of this tisane, I recommend steeping it at a just below boiling point (195°F) for 10 minutes. I go with the slightly lower temperature because this helps to avoid the sour wood taste that sometimes accompanies rooibos and honeybush … while still achieving the maximum amount of flavor out of a honeybush (or rooibos) blend. Vanilla fans … this is your answer for those late at night cravings! This will satisfy those sweet tooth cravings without any caffeine! This tisane brings back memories! Back when I flavored and blended teas, I had a delicious organic vanilla honeybush, and this tastes quite a bit like that one did. The naturally sweet, nutty flavor of the honeybush seems to marry very well with the creamy tones of vanilla. The result is a sweet, smooth cup that is delicious any time of day. While I am enjoying this (and it is good hot or iced!) I think it would be even better with a bit more vanilla flavor. As it is, it has a pleasing vanilla note, but, I think that a little more vanilla would help to tone down the slightly sour wood note that I taste toward mid-sip. It isn’t what I’d call “off-putting” but, I think it would taste better without it. In addition, I think that the additional vanilla flavor would give it a little more body, and I’m finding this cup to be a wee bit on the thin side. Overall, though, this is enjoyable. Makes a sweet, cozy cup to enjoy later in the evening when you might want something a little on the sweet side, this can help curb those cravings. A nice, relaxing cup. Chamomile Lemon Drop is a smooth blend of very healthy Sencha green tea with fresh-cut ginger root, lemon myrtle, a few citrus peels, lemon grass, orange preserves and English chamomile. This is a very refreshing green tea that we like to drink in the early afternoon. I reviewed this tea previously, but, it’s so good that I feel like writing about it again! This is a really delicious blend. The flavors are very well balanced. Nothing overpowering or competing with anything else. Just a refreshingly light tea experience that is pleasantly sweet. 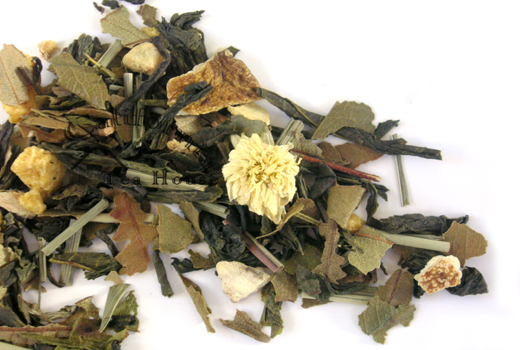 The Sencha is light and offers a hint of buttery taste to the cup which is further complimented by the lemongrass. This tastes lemony, but it isn’t sour. It is lightly tart, and leaves a citrus-y tingle on the tip of tongue in the finish. The chamomile is delicate in this blend, as is the ginger. It is incredibly relaxing to sip, and it is one that I’d recommend for early evening when you’re at that point in your day that you want to wind down but aren’t quite ready to pack it in yet.